Apple on Wednesday reported a profit of $1.21 billion for its fiscal second quarter ending March 28, 2009, buoyed by strong iPod and iPhone sales. Mac sales were down three percent for the quarter compared to last year, but sales of the iPod and iPhone were up for the same period. "We are extremely pleased to report the best non-holiday quarter revenue and earnings in our history," Peter Oppenheimer, Apple’s CFO said during the conference call announcing the results. Apple’s $1.21 billion, or $1.33 per diluted share, was posted on revenue of $8.16 billion, the best non-holiday quarter revenue and earnings in Apple’s history, according to Oppenheimer. This quarter’s revenue and profit was higher than the $7.51 billion revenue and $1.05 billion profit posted during the same quarter last year. Apple beat the prediction of Wall Street analysts who pegged the earnings per share to be $1.09. The company sold 2,216,000 Macs in the quarter, down three percent from the year-ago quarter. Laptop sales claimed 63 percent of total Mac sales, with 1,398,000 units. 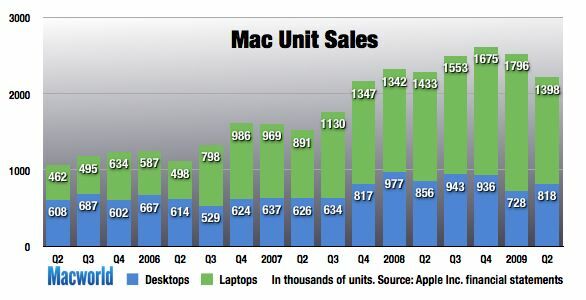 Desktop Macs accounted for the remaining 818,000 units. Oppenheimer said that Apple believes strong sales of iWork '09 and iLife '09 had a lot do with drawing people to the Mac, and COO Tim Cook described the Mac product pipeline as "fantasic." 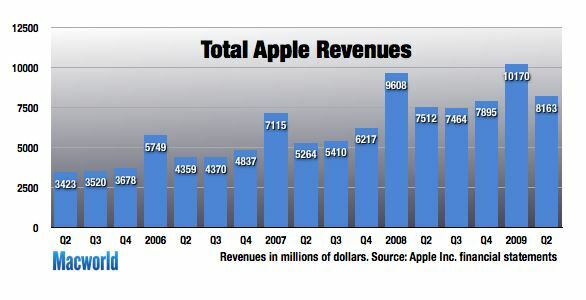 Analysts weren't concerned about the drop in Mac sales, at all. "For the most part that's roughly flat, which is not a huge surprise," Michael Gartenberg, vice president of Strategy and Analysis at Interpret, told Macworld. "It's indicative of the fact that consumers aren't spending as much as they did in past, but they are being careful about where they spend." In this poor economic climate, being careful about spending means that consumers are looking for quality products, not cheap products. This plays into Apple's long time message of making quality computers. When asked about Apple's plans for releasing a netbook, Cook said, "If we find a way that we can deliver an innovative product that really makes a contribution, then we will do that—we have some interesting ideas in this space." Cook said that netbooks currently have cramped keyboards, terrible software, junky hardware, and very small screens, "not something that we would put the Mac brand on, quite frankly." He added that people who want a small computer that does browsing and e-mail might want to buy an iPod touch or an iPhone. NPD analyst Ross Rubin doesn't disagree with Cook, but says "the drop [in Mac sales] is in part attributable to the unit volumes we've seen in the PC netbook segment." Rubin does say the iPod "touch can do some of the things that vendors have set the netbook to do, but it;s not a good comparison." 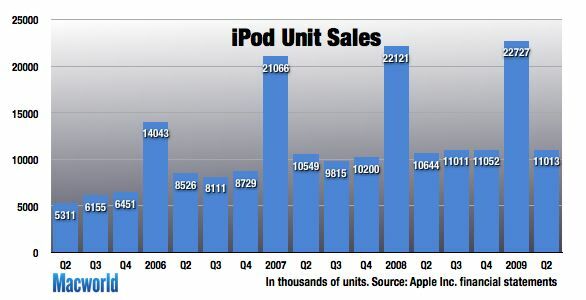 iPod sales of 11,013,000 were up three percent over the same quarter last year. Apple said its U.S. market share for digital music players is more than 70 percent, based on data from market-reseach firm NPD. The iPod also continues to gain share year-over-year in worldwide markets, with healthy unit sales growth in the U.K., France, Germany, Japan, Australia, and China. 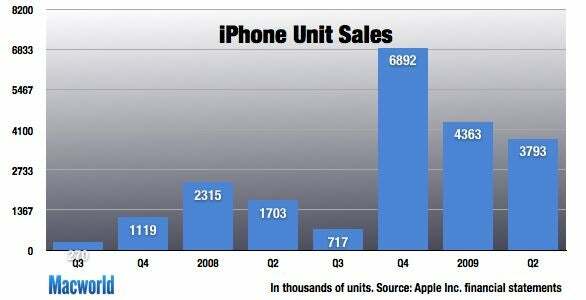 iPhone sales were 3,793,000, up 123 percent over the same quarter last year, and Apple has sold more than 21 million total iPhones. Apple is now selling the iPhone in 81 countries. Cook said that Apple views AT&T as very good partner, and as the best wireless provider in U.S. "We're very happy with the relationship and do not have a plan to change it," Cook said. When asked about getting the iPhone into China, Cook said that Apple would like to start selling there within the next year and are working on doing so. Apple also said that the iTunes Store had good quarter, helped but changes including DRM-free music. The App Store now offers more than 35,000 applications, compared to 15,000 available three months ago—and Apple said it was "within hours" of reaching the one billion app download mark. Apple said that international sales accounted for 46 percent of the quarter’s revenue. Oppenheimer said the company’s financials are “very robust, with almost $29 billion in cash and marketable securities on our balance sheet.” For the third quarter, Apple expects revenue of $7.7 billion to $7.9 billion with earnings per share at $.95 to $1.00. "These kind of numbers in this economic climate are staggering," said Gartenberg. "They even took Wall Street by surprise." Apple stock closed down $.25 or 0.21 percent at $121.51. In after hours trading the stock is up $2.83 or 2.33 percent at $124.34.